Trigun is an anime that many people recognize. It's one of my favorites. It's the epic sci-fi space western that carries just the right amount of silliness and the right amount of seriousness. To date, it's the only time I've ever seriously sat down to write fanfiction about an anime. Not saying it was good fanfiction (most fanfiction isn't good), but it's an attempt I made nonetheless and the last time I looked at it it wasn't terrible. It's on this site if you wish to read it. 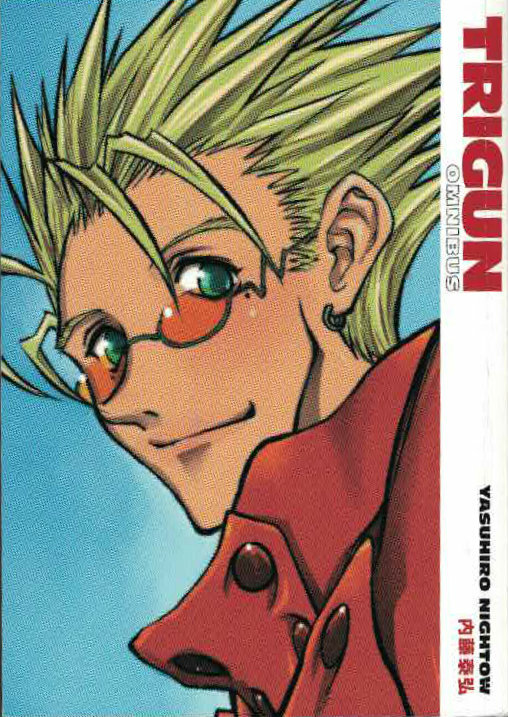 Before I get into specifics, I do want to state just what the Trigun Omnibus is. This isn't the entire manga. Sort of. This manga is the first and only two volumes of the Trigun manga, but the rest of the volumes were published as Trigun Maximum when Nightow changed publishers. So yes, the two volumes and the omnibus which collects them are the only titles you'll find carrying solely the Trigun name. Everything else is either Trigun Maximum or a spinoff of the anime or some sort of tribute. I'm going to do this review in two parts since this is really two volumes. The start of our story is really episode five of the anime for those that want to keep score. The anime is largely adapted from these two volumes and in order to make two volumes fit into 26 episodes some filler had to be made. Although the first episode of Trigun is adapted from a bonus story at the end of the second volume. We are introduced into the world of Gunsmoke where the $$60,000,000,000 man roams around. The man with such a price on his head is Vash the Stampede. He's also known as the Humanoid Typhoon for the destruction he leaves in his wake. He's a nice guy and a pacifist, but we see him sitting in a desolate wasteland at the start of the story. He's sitting in the town that used to be July where all of the inhabitants were wiped off the face of the map and only he remained. Whatever happened to July is how he gained that large price on his head. There are other glimpses sprinkled throughout the two volumes that basically tell us that the Vash is over a hundred years old and definitely isn't human. That's where the whole "space" comes from in this "space western." Flash into the present and we have a group of goons that are after the price on Vash's head. They corner Vash in a bar in the town of Valdour, but Vash is no slouch and manages to defeat them quite easily. However, the entire town realizes that Vash is worth a lot of money and suddenly Vash is being chased by every mother, father, and child in Valdour. Then the dreaded father and son from the Nebraska family get drawn into the chaos. The Nebraska family were hired by the chairman of this campaign, but the Nebraska family are criminals and they aren't so fond of all these civilians. This puts Vash in a situation where he not only has to protect himself, but the civilians of Valdour that had been chasing him. In this story we also meet the Bernardelli Insurance girls, "Derringer" Meryl Stryfe and "Stungun" Millie Thompson. The girls are after the Human Typhoon so they can keep tabs on his movements. I hope that job has hazard pay. Vash's bounty had, somewhat ironically, been written off and Vash was declared a "localized disaster" by the Bernardelli Insurance Company. Which means that his bounty is zilch and the entire gunfight had been for nothing. Ha ha. Our second arc is the Brilliant Dynamites Neon arc. This should also seem familiar to viewers of the anime. Basically, a sandsteamer (a large land-travelling ship, essentially) pulls into Valdour and Vash sees this as his chance to escape the insurance girls. So he does. But he stumbles into a heist masterminded a young troubled kid and Brilliant Dynamites Neon of the Bad Lads Gang. Neon wants to crack open the safe onboard, but it's not the kind that he can get into so easily so he decides he'll just crash the ship off a huge cliff. Facing impending doom, Vash (and the insurance girls that had stowed away as well) must do whatever it takes to avoid being flattened like a pancake. The ultimately leads to a duel between Vash and Neon. Our final arc in this story is the Little Arcadia arc. Fans of the anime will remember this one as the snot-nosed kid that wanted to take his parents' beautiful green land. The land is leftover from the ships that transported earth's population to Gunsmoke. Gunsmoke is a desert world so the greenery is a literal Arcadia in the middle of nowhere. It's rare. So naturally a bunch of greedy bastards want it for themselves. Badwick, the snot-nosed douche in question, works for just one such person. But when it seems like Badwick's methods won't work the big boss calls in the mother and daughter of the Nebraska family. Outside of a brief scene that features Vash breaking the fourth wall, the heroes of this story are Meryl and Millie. This is their time to shine and it's a nice little story to conclude the volume. This is where things get really good. Much of this will still be familiar to viewers of the anime, but the differences begin to set in here. This is where we meet Legato and a few members of the Gung-Ho Guns including Monev the Gale, Dominique the Cyclops, and E.G. Mine. At least, those are the ones Vash has direct confrontations with. We also meet Wolfwood the Chapel, Gray the Ninelives, Zazie the Beast, Midvalley the Hornfreak, Rai-Dei the Blade, Hoppered the Gauntlet, and Leonhoff the Puppetmaster. And of course we get to meet Knives, the antagonist of this whole thing. Knives happens to be Vash's brother and something that happened in past (possibly during the incident that wiped out July) put Knives out of commision for a while. Knives, among his many evil actions, is responsible for the death of Rem Seibrem, Vash's surrogate mother. This was back when all of humanity was onboard the SEEDS ship a hundred years or so in the past. So there's a lot of bad blood between them and Knives is the cause of it all. Knives is a psychopath that hates humans, but he loves his brother Vash and he wants the two of them to eradicate humanity together. Ain't that sweet? Those familiar with the anime will be familiar with many of the Gung-Ho Guns, but obviously Wolfwood will be the most familiar face. Perhaps even more so than Legato. In the anime you never really knew of Wolfwood's affiliation with the Gung-Ho Guns until long after his introduction. But in the manga he is present when Knives gets reborn and he is referred to by Legato as "Chapel." He witnesses Knives manipulate Vash's "angel arm" and sees the hole get put in the Fifth Moon while standing by the rest of the Gung-Ho Guns. This puts a different spin on things for viewers of the anime. Wolfwood appears to be the same likeable character from the anime, but we discover he is a servant of Knives before he has a single adventure with Vash. Legato also meets an apparent early fate. Possibly. When Legato sees Vash at the end he immediately gives the order for the other Gung-Ho Guns to kill him, but this causes Knives to get angry and literally push Legato into the ground so hard his legs appear to snap forward. If he's alive it will interesting to see what role he plays in future installments. But after putting a hole in the Fifth Moon, Vash disappears for two years and this volume concludes. The story picks up again in Trigun Maximum. I think fans of the anime should pick up this manga if they haven't already. It's what we know and love, but it promises a story that is different than the anime. Trigun Maximum looks like a treat that I have overlooked for far too long.